13th March 1908 to 30th July 1944. Placed in the London Gazette 17th September 1940. On the 26th of August 1940, at Crohamhurst Golf Course, near Croydon, Surrey. 2nd/Lt Andrews in charge of the 22 and 23 Bomb Disposal Sections, when a bomb fell and failed to detonate near the aerodrome. The fuse, in this bomb, was needed at the Department of Scientific Research. Therefore 2/Lt Andrews attempted to extract the fuse, several times all with no success. 2/Lt Andrews then withdrew his men to safety. When they reached a point of safety, he attached a cord to the fuse discharger ring and pulled. The bomb exploded, throwing 2/Lt Andrews a considerable distance and injuring two of his men with splinter wounds. For this action 2/Lt W.A. Andrews was awarded the Empire Gallantry Medal, (EGM) which later was exchanged for the George Cross.On the 30th July 1944, the now Major Andrews died of war wounds sustained whilst Chief Instructor Bomb Disposal Ripon. Placed in London Gazette on the 30th September 1941.The action that Acting Lt (A/Lt) Archer was awarded the George Cross, occurred on the 2nd September 1940. 2nd/ Lt Archer, had been employed on Bomb Disposal work since June 1940 and in that time had dealt with over 200 bombs. He’s courage and nerve, never faltered through out this period. On the 2nd September 1940, A/Lt Archer with his section was dispatched to the Anglo-Iranian Oil Company, At Llandarcy, near Swansea. where a complete stick of bombs had fallen, without detonating. Several oil tanks had been set alight, which increased the risk and made the operation more hazardous. Two of the bombs exploded whilst A/Lt Archer was dealing with the most dangerous bomb, it was clearly apparent that this bomb could also detonate at any moment. The task continued for many hours, before the bombs fuse was removed and it was made safe.For this act Acting Lieutenant B.S.T. Archer was awarded the George Cross.His Citation reads:”The King has been graciously pleased to approve the award of the George Cross in recognition of the most conspicuous gallantry in carrying out hazardous work in a very brave manner. Having reached the rank of Colonel, Archer retired in and is has been Chairman of the VC and GC Association since August 1940. Placed in the London Gazette on the 22nd January 1941.In September and October 1940, the blitz’s early days, Acting Major (A/Major), Barefoot was a pioneer of bomb disposal work. He worked on some of the first unexploded bombs to fall on mainland Britain. He also worked on the first magnetic mine, suspended by parachute. The results of which put invaluable information in the hands of the authorities. His bravery and devotion to duty, were an inspiration to all the men under him.For these actions Acting Major H.J.L. Barefoot was awarded the George Cross.His citation reads:”The King has been graciously pleased to approve the award of the George Cross, for the most conspicuous gallantry in carrying out hazardous work in a very brave manner.Also the award given to 2nd/Lt Campbell and Sgt M. Gibson. (See there individuals entries). H.J.L. Barefoot was also awarded the British War Medal, Victory Medal with Oak Leaf, Defence Medal, War Medal and 1953 Coronation Medal. Interestingly Barefoot also served in WW 1 in both the RNVR and the Sanitary Company of the RAMC. 19th November 1910 to 13th December 1940. Award placed in the London Gazette 15th April 1941.In the early hours of the 18th September 1940, an unexploded bomb landed in the middle of Manor Way. This was a short distance from the junction with East Ham and Barking by- pass. This caused traffic, to the Royal Arsenal and other strategic industrial undertakings, to grind to a stand still. Acting Captain, (A/Capt), Blaney was called and removed the bomb, enabling thousands of war-workers to continue on their way to work. The 20th October saw an unexploded bomb fall in Park Avenue, East Ham. The bomb was fitted with two dangerous time fuses, very few bombs were fused in this manner, and therefore it was a very real threat to Public Utility Services, and of a great threat to the Bomb Disposal Section when they were defusing it. A/Capt Blaney personally defused the bomb, as normal it was his practice to work alone. Again on the 13th December 1940, Blaney was called to a premise abutting Romford Road, Manor Park, where a bomb had fallen, some days previously, to remove the fuse. This bomb was causing serious disruption to traffic. As usual he crawled into the crater alone, in order to tackle the bomb, which exploded and Blaney lost his life.His citation reads “The King has been graciously pleased to approve the award of the George Cross, for most conspicuous gallantry in carrying out hazardous work in a very brave manner. 1904 to 10th March 1969. Placed in the London Gazette 17th September 1940.On the morning of the 18th August 1940, Lance Sergeant Button, with No 48 BD Section was ordered to continue the excavating of an unexploded bomb. Due to the time already elapsed on the excavation, Button knew that there was a strong possibility that the bomb could explode at any time. Regardless of this he continued with his section to excavate the bomb, showing great coolness.Eventually the bomb exploded, killing five members of the section, Lance Sergeant Button was thrown some distance by the explosion. Although shaken, Button gathered the rest of the section, checked that none were injured and informed the First Aid detachment, he then reported to his Section Officer.For his actions Lance Sergeant W.J. Button was awarded the Empire Gallantry Medal, later this was exchanged for the George Cross. Placed in the London Gazette on the 22nd January 1941.Second Lieutenant Campbell was called to deal with an unexploded bomb on the morning of 17th October 1940. This had fallen in the Triumph Engineering Works, in Coventry. The bomb had caused the two factories production to cease and a large number of local residents had been evacuated. On inspecting the Bomb Campbell found it was fitted with a delayed action fuse, this was impossible to remove. Therefore Campbell decided to remove the bomb to a safe place. The removal was completed by using a lorry, as Campbell lay alongside the bomb on the lorry bed, so he could hear if the bomb had started ticking, in this case he could have warned the driver, so they could stop and run for cover. Once they reached a safe distance he disposed of the bomb.Regrettably 2nd/Lt Campbell, Sgt M.Gibson, Spr W. Gibson, Spr R.Gilchrest, Spr J. Plumb and Spr R. Wm. Skelton. were also killed the next day 18th October 1940. Campbell’s citation reads; The King has been graciously pleased to approve the award of the George Cross, for most conspicuous gallantry in carrying out hazardous work in a very brave manner. Placed in the London Gazette on the 30th September 1940.An unexploded bomb fell in close proximity to St Paul’s Cathedral, 12th September 1940, Lieutenant Davies was the Officer in Charge of the party called upon to recover the bomb.Lt Davies was conscious of the imminent danger this bomb presented to St Paul’s and regardless of the risk to himself or his men, he spared nobody in the search for this bomb. The bomb was located by Sapper G.W. Wylie, who located it deep under the pavement in front of St Paul’s. By unremitting efforts the bomb was removed, all the time Davies and his party were aware of the strong possibility that the bomb would explode.To prevent his men from further risk Davies drove the vehicle himself to transport the bomb and carried out its disposal.For this action Lieutenant R. Davies and Sapper G.W. Wylie were awarded the George Cross.Lt Davies citation reads; The King has been graciously pleased to approve the award of the George Cross as Officer in charge of the party dealing with the St Pauls bomb. Placed in the London Gazette on the 11th March 1943.From the beginning of the Blitz and during the heavy raids of 1940/41, Major Martin carried out Bomb Disposal work and dealt with a large number of unexploded bombs during this period. He continued with this work through to 1943. During the night of the 17th/18th January 1943, a large bomb fell into the warehouse belonging to the Victoria Haulage Company in Battersea. The warehouse at the time contained heavy machinery new from the United States. Due to the importance of the machinery this bomb was a high priority for disposal.Once examined it was found to be fused with a new type, this was an extremely formidable fuse as it contained an anti handling and booby trap, also it was proof against any known disarming techniques with equipment then in service.A decision to remove the base plate, then extract the explosive filling was made. Major Martin was called to carry out this task. The base plate was removed, Major Martin then found that the explosive content was of the solid cast TNT type, which would require steaming at high pressure.The normal process for steaming, by remote control was deemed to risky. For this task the steam nozzle was directly applied by hand and used a low level amount of steam, enough to just soften the TNT fill, so it was pliable enough for it to be scrapped away.Major Martin assisted by another Officer undertook this nerve racking task, which took from the 20th afternoon till 08.30 the next day. At this time they had succeeded in removing the entire TNT content. This work was completed by working through a small hole, filled with water and steam and laying alongside the bomb. This operation was both dangerous and of a long duration, as on two separate occasions, when Martin dealt with similar devices, he showed almost unbelievable and cold blooded courage. Lt R.W. Deans assisted in this operation, he was awarded a George Cross, London Gazetted on the 11/03/43.Major C.A.J. Martin’s George Cross was awarded for multiple acts, during air raids of the 17/18th January 1943, the act described above and on the 2nd February a bomb found in the old Kent Road and another on the 4th February 1943. Major Martin’s citation reads; The KING has been graciously pleased to approve the award of the George Cross, in recognition of most conspicuous gallantry in carrying out hazardous work in a very brave manner.Martin received a Military Cross during World War 1, as a 2nd Lieutenant in the RGA Special Reserve. The London Gazette reads for this award; For conspicuous gallantry and devotion to duty, he with two men extinguished a burning ammunition dump, under heavy and continuous fire, while overheated ammunition exploded nearby, he showed great coolness and resource. 25th November 1892 to 4th November 1972. Placed in the London Gazette on the 3rd December 1940. A brief explanation is necessary to explain Dr A.D. Merrimans inclusion under Royal Engineer Bomb Disposal, George Cross awards. Dr Merriman received an emergency general list commission in December 1940. He was sent to the C in C Middle East as Assistant Director Bomb Disposal. In 1942 he was transferred to the Royal Engineers. Late 1942 he was a Major, (Temporary Lt Colonel) Dr Merriman was awarded the George Cross for; As an Experimental Officer, for the Directorate of Scientific Research, who tackled some of the first bombs to fall on Britain early in the summer of 1941. Supposedly Merriman was only part time in his position, with predominantly Office duties, he in fact on many occasions dealt with dangerous bombs at the request of the War Office and Air Ministry, in these roles he was a volunteer. As Director General of Scientific Research, he on the 11th September 1940 dealt with a bomb, which had fallen in Regent Street, London.The bomb was heard to be ticking as they started work, they all were aware that this meant the bomb was on its countdown to explode. The decision was made to remove as much of the explosive filling as possible before that happened. This would reduce the damage and make the bomb relatively harmless. They worked till the last moment, the timing was perfect, at the last moment they got away and the only damage was some broken windows. 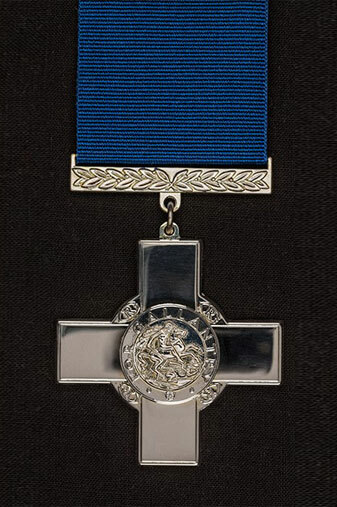 Doctor A.D. Merriman’s citation reads; The KING has been graciously pleased to approve the award of the George Cross, for conspicuous gallantry in connection with Bomb Disposal. Placed in the London Gazette on the 17th December 1940.Lt Patton was called to the Vickers Aircraft factory at Weybridge on the 21st September 1940, where a large unexploded bomb had been found, he was not a member of any established Bomb Disposal Unit. As he could see no obvious way to defuse the bomb, he made a decision to move it to a safe place. As if it detonated it would have badly disrupted aircraft production. With another Officer the bomb was handled onto a piece of corrugated iron, which was used as a skid. This was then attached to a lorry and towed away, it tumbled into another bomb crater and exploded some hors later.Lieutenant J.M.S. Patton’s citation reads; The King has been graciously pleased to approve the award of the George Cross, for most conspicuous gallantry in carrying out very hazardous work.Lt Patton was the first overseas Officer to receive the George Cross.He was awarded the CBE. For public Services to Bermuda in 1947. Placed in the London Gazette on the 17th September 1940.Lieutenant E.W. Reynolds, a member of one of the new Bomb Disposal Sections, was called on the 17th August 1940 to deal with a 250 kilo unexploded bomb, in the garden of a council house at Congrebury. The bomb was dug down to at a depth of 17 feet. The bomb had a new type of fuse fitted. There were no details or instructions as to how this type was to be dealt with. Traffic was stopped and local residents evacuated. The fuse was removed and found to be of a delayed clockwork type. His actions were risky and the merit of his actions was great for the lack of exact knowledge of this type of fuse.Lt Reynold was again called out on the 3rd September 1940, in Temple Street Bristol where a large bomb had fallen and not detonated on the night of September the 1st 1940.It was believed initially to have exploded as damage to the front of business premises was apparent. However, at 16.30 on the 3rd September, a 250kilo bomb was discovered. Lt Reynold was called to the site, he found the fuse to be clocking and ticking. Following laid down procedures he contacted Regional HQ, there view that the sooner, the bomb was dealt with the better, Reynolds stated that he was willing to deal with it, immediately. His view was that if not dealt with there would be great damage to property due to the size of bomb and this would have an effect on the publics morale. Permission was given to carry on, Reynolds extracted the fuse immediately rendering the bomb inoperative. The risks in this operation were considerable. Lieutenant E.W. Reynolds was awarded the Empire Gallantry Medal which was later exchanged for the George Cross, for the above operations. 100411Second Lieutenant Ellis Edward Arthur Chetwynd Talbot 103 Bomb Disposal Section Royal Engineers George Cross Member of the British Empire.1939-45 Star, Africa Star, War Medal 1939-45 22nd March 1920 to 9th October 1941. Placed in the London Gazette on the 17th September 1940.2nd Lt Talbot on the 24th and 25th of August 1940 was present for the whole period, when a bomb was dug down to, the recovery of this took twelve and a half hours.On reaching the bomb, it was brought to the surface and Talbot investigated and found it was of a delayed action type. He ordered his men to safety.The bomb was found to be of a new type and Talbot decided to move it to a place were it would cause no damage if it exploded. He kept his men at a safe distance and placing the bomb upon his shoulder carried it 200 yards to a safe spot. At all times there was a risk of the bomb exploding. Lt Talbot set a fine example of courage and devotion to duty.2nd Lieutenant Talbot’s citation reads; The King has been graciously pleased to award the Medal of the Military Division of the Most Excellent Order of the British Empire. This was later exchanged for the George Cross.Lt Talbot was killed on the 9th September 1941 near Sicily, whist a passenger on a RAF Blenheim, on a bombing raid. On the 12th September 1940 a 2,000kg bomb landed close to St Pauls Cathedral. Sapper Wylie located the bomb in embedded in the soil in Deans yard.Due to its weight and the soft soil, the job of removing the bomb from the ground was an arduous task, which took three days. The task was made that bit more hazardous by a broken gas main, on fire, being nearby.Wylie and his team removed the bomb from the ground and placed it on a lorry that Wylie drove himself, with Lt Davis to Hackney Marshes, where it was detonated by an controlled explosion. The crater was 100ft, what damage would this have caused to St Pauls.Wylies citation reads; The KING has been graciously pleased to award the George Cross, to Sapper Wylie, The actual discovery and removal of the bomb fell to him. Sapper Wylie’s untiring energy, courage, and disregard for danger were an outstanding example to his comrades.